HP and Google have collaborated to produce the new HP Chromebook 13, an ultra-thin laptop powered by the sixth generation Intel Core processor. The all-metal Chromebook 13 is only 12.9 millimeters (0.5 inches) thick when closed and weighs 2.86 pounds. The new HP Chromebook 13. The device includes a battery that can last up to 11 hours, sound engineered by audio experts from B&O Play, plus a 13.3-inch diagonal QHD display (3,200 x 1,800 pixels). The new Intel Core processor is designed to allow for multitasking and videoconferencing without lag. The Chromebook 13 features a 32 GB hard drive, up to 16 GB of internal memory, a backlit keyboard and fast USB-C ports. It operates on Google’s web-based Chrome OS, which provides quick boot time, mobility and multi-layered security. An optional USB-C docking station offers dual high definition displays, full-size keyboards, wired networks and charging, for a full desktop experience. 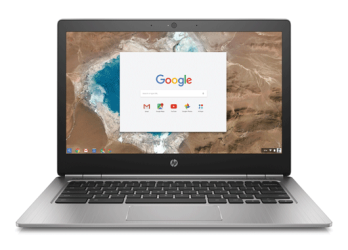 The HP Chromebook starts at $499 (not including a $50 management fee) and is available from HP or through the Chrome for Work site.